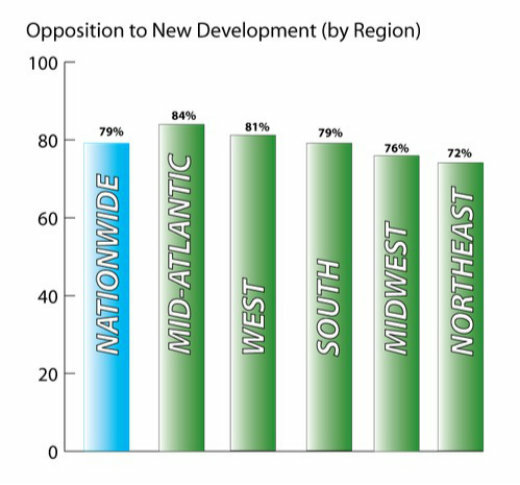 79% of Americans want no new development projects in their communities. That does not mean they are against development. ... They just do not want it anywhere near them. Editor's Note: We're pleased to offer you three articles by Patrick Fox, President of The Saint Consulting Group. In addition to today's provocative article, take a look at "10 Things You Should Know About Project Applicants," and "10 Things You Should Know About Project Opponents." Just some brief background. The Saint Consulting Group specializes exclusively in land use politics and has been engaged in thousands of controversial land use battles across the U.S., Canada, and the United Kingdom. They conduct The Saint Index, an international survey that studies opposition to development projects. Combining years of field experience and work on the Saint Index, Patrick offers the following 10 Things You Should Know About How the Public Feels About Development. 1. Stop all development anywhere near me. 79% of Americans want no new development projects in their communities. Now that does not mean they are against development. They are not. They just do not want it anywhere near them. They want new jobs, local tax dollars and new shopping opportunities, but it should be over there and not right here. While NIMBYism is strongest in the Mid-Atlantic and West, a basic hostility to local development projects persists, regardless of region. 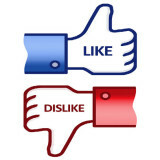 Residents of rural communities expressed the least unfriendliness toward new local development. From The Saint Index: United States 2011. It is now far easier for a local politician to stand with the passionate, active and angry opponents than to support development. 2. All development is political. 84% of American say a candidate’s position on development is important when they decide for whom they will vote, so development takes an increasingly prominent role in local politics. It is now far easier for a local politician to stand with the passionate, active and angry opponents than to support development. The politics of development now favors opposition. Good projects die every day because they lack political support in the face of active and motivated opposition. 3. The system is broken. 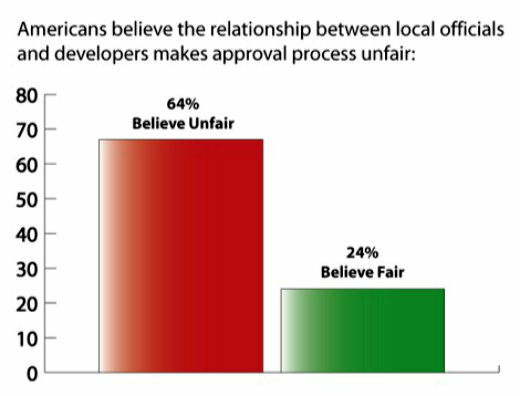 64% of Americans say the relationship between developers and elected officials makes the process unfair. They believe the game is rigged for developers and politicians and it makes them angry and frustrated. 4. Anti-competitive opposition to development is prevalent. 78% believe businesses have a right to actively support or oppose a competitor’s development project, and 62% are not surprised to hear that opposition efforts are actually funded by competitors. It happens far more than you think. Even when a community has widespread support for a project, the opponents dominate the process because they show up. 5. Opposition shows up. 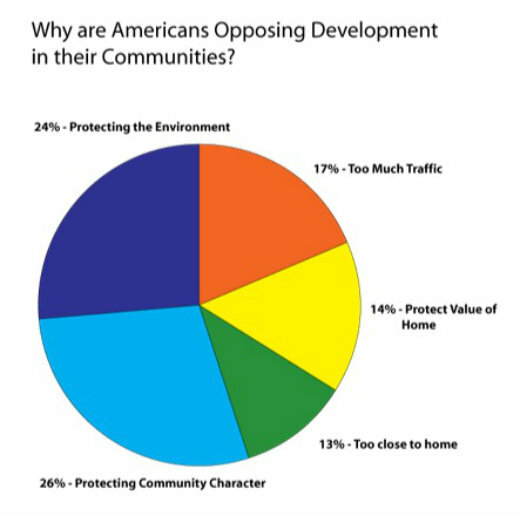 One out of six Americans have actively opposed a development project in their community. Even when a community has widespread support for a project, the opponents dominate the process because they show up. Opponents are much more motivated than supporters, and that severely warps the approval process in many communities. The reasons Americans give for fighting projects don’t tell the entire story. While just 14 percent said it was to protect the value of their home, six years of Saint Index results show that is not an accurate gauge of how big a role that motive actually plays in opposition to development. From The Saint Index: United States 2011. 6. Traffic is destroying our quality of life. From our experience in projects across three countries, it is the Achilles heel of most projects, and it is the item most likely to scare residents and mobilize opposition. It is very hard to address because no one believes mitigation measures will actually work. 7. Real involvement by the public is discouraged. The system is designed to make constructive input by residents difficult, and public involvement is simply tolerated and looked upon as a check box process. Scheduling of meetings, agendas that make residents sit for hours before speaking and various delays lead the public to believe that their input is not sought or truly welcomed. They are not allowed an active role in the process in many cases. As far as the public is concerned, there is often no rhyme or reason to what gets built. 8. Development approval decisions are bizarre. As far as the public is concerned, there is often no rhyme or reason to what gets built. Things appear in the town center, and the public scratch their heads wondering how anyone could have ever let that thing get built there. They were not paying attention to the lengthy public process that led to its approval or the articles in the local weekly paper following the debate. Now it’s there, and they are seeing additional traffic, and they don't understand how it could have happened. 9. Jobs and new tax dollars are not enough. It used to be that politicians ran for reelection bragging about the economic development projects they brought home to their districts. They took credit for the new jobs, tax revenue and local investment that came from new development, but that is gone now. It is not enough anymore. Now it is far more politically advantageous to stand with the opponents of development and fight against new projects. We have seen the landscape for development fundamentally changed over the past 20 years, and it is increasingly difficult to get anything approved. If you take the time to really involve neighbors and local activists, they may just learn to trust you and the process. 10. People want to be asked. Do not wait for a public hearing to ask for input. That’s often too late. Involve people in the process early and ask them what they think about various plans before they are complete and up for a vote. It takes time and a real commitment to public dialogue, but if you take the time to really involve neighbors and local activists, they may just learn to trust you and the process. You will not win them all over, and there will always be intractable opposition, but you can build real understanding and consensus with some effort. Patrick Fox is president of The Saint Consulting Group, a land use political consultancy. He has managed or consulted on hundreds of land use projects across the United States, Canada and the United Kingdom, adapting state-of-the-art grassroots political campaign techniques to win controversial land use battles. 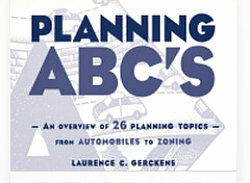 Patrick is co-author of the book, NIMBY Wars - The Politics of Land Use. He also developed the Saint Index, the world’s only international survey that quantifies and analyzes opposition to development, which has been featured in The Wall Street Journal, The Economist, and many other media. With experience on more than 1,800 controversial land use permitting projects in 46 states, Canada and the United Kingdom, The Saint Consulting Group is the global leader in land use political consultancy. Saint Consulting has worked in all industrial sectors, both for and against the permitting of new land use projects. 1. Stop all development anywhere near me. 2. All development is political. 3. The system is broken. 4. Anti-competitive opposition to development is prevalent. 6. Traffic is destroying our quality of life. 7. Real involvement by the public is discouraged. 8. Development approval decisions are bizarre. 9. Jobs and new tax dollars are not enough. 10. People want to be asked.